Our list of Koh Chang beachfront hotels are located on the most pristine ribbons of sand in Thailand which has escaped the footprint of mass tourist crowds unlike many other commercialized destinations. Subsequently they offer more personal space, unhindered relaxation and unobstructed views to create the ideal circumstances for an island escape with an original touch. Henceforth this is an opportunity to explore an unscathed exotic destination allowing you to hike in virgin jungle, visit waterfalls, snorkel in an underwater world bursting with exotic marine life or just stretch out on an immaculate ribbon of sand and bask in content. Yet, while this exotic gem will make you feel one with nature you will still experience the epitome of barefoot luxury, gracious hospitality and modern convenience when you book beachfront accommodation at our selected hotels. The best time to go depend on how important dry weather is as apposed to securing the cheapest deals. The rainy season is from May to October when you can score big with special deals while still being able to catch a tan. November to February is dry with higher prices, but if you like things really hot March and April is ideal. Whenever you go, you can count on us for the best deals. 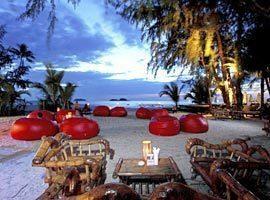 Aiyapura overlooks peaceful Klong Son Bay just north of much busier White Sand Beach. It offers charming Thai styled bungalows and private pool villas dotting an expansive tropical forest setting spilling directly onto the sand. 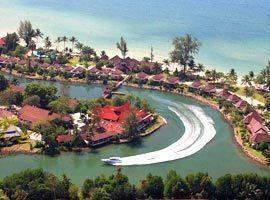 Located on its own beach in restful Klong Prao you can expect unhindered relaxation. The resort features a 50 meter lap pool and children's pool, a fitness centre, pampering spa and luxurious Amari style accommodation. Settling between the edge of a lush jungle of a protected national park and a emerald ocean, this boutique hotel offers romantic accommodation in garden and sea view bungalows featuring 4 poster beds and private terraces. Right next to a quiet ribbon of sand where water sports and oceanfront pool can be enjoyed Centara Tropicana enjoy impeccable reviews. Its lofty cabanas and suites hidden among tropical plants feature wooden floors and vaulted ceilings. 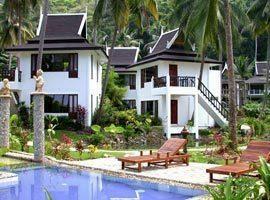 Chivapuri's beachfront villas have a charming Thai style and many offer enchanting ocean views. 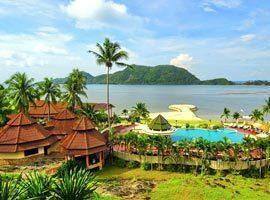 There is also a 2 bedroom, 2 bathroom family sea view room. 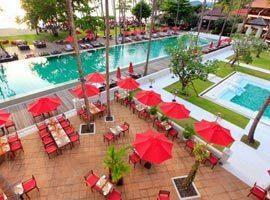 Deluxe garden rooms and deluxe sea view rooms all feature extensive outdoor terraces. 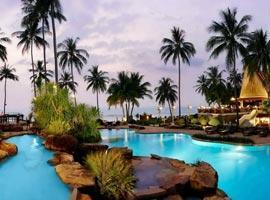 KC Grande Koh Chang is a 4 star resort in White Sand Beach, a vibrant part of the island near restaurants. 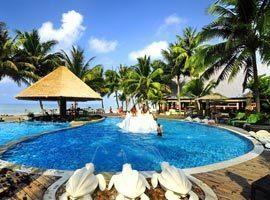 It features pool access rooms, a kids club and 4 pools including one ocean-side, a roof top pool, kids pool and slide. Klong Prao Resort getting its name from the area in which it resides has a dreamy setting on the banks of placid lagoons surrounded by tropical foliage. Laguna rooms feature separate lounge areas while villas offer guaranteed sea views. 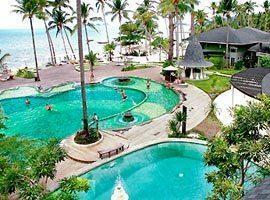 Mercure is a luxurious and modern hotel with a private beach. Add to this private pool villa accommodation and the stage is set for a romantic holiday. If its your wedding anniversary a kids club is available to free up your hands. Panviman is located on utterly serene Klong Prao Beach and feature traditional Thai styled bungalows with wooden four poster beds and separate sitting areas. Pool access rooms allow you to take a dip from your private terrace.